Dr. Conger grew up in Southwest Georgia and completed his undergraduate training at the University of Georgia, where he graduated with high honors. He earned his Doctor of Medicine degree from the Medical College of Georgia and completed his internship and residency in otolaryngology and head and neck surgery at the University of Alabama at Birmingham. 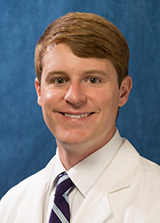 During his final year of training, he served as Chief Resident and was actively involved in academic and leadership activities, both at the local and national level. He has conducted research in sinus disease and head and neck surgery and has published manuscripts in national medical journals. He is also a member of the American Academy of Otolaryngology – Head and Neck Surgery. Dr. Conger’s surgical and clinical specialties include the treatment of sinus disease, pediatric ENT disorders, hearing and balance problems, sleep apnea and snoring, voice and swallowing disorders, and head and neck cancer. He lives in Dunwoody and his interests include mountain biking, cooking and college football.